Sweet Potatoes & Alfredo — Vegan Perfection! In flipping through Vegan Yum Yum, I’ve found that Lauren Ulm seems to have a hangup with kale. It pops up in a ton of the recipes, from soups to bakes to noodle dishes. Fortunately for me, I also happen to love kale and always have some around, whether fresh in the summer and fall or frozen over the winter. So why am I babbling about kale when this is supposed to be a post about sweet potatoes? Because kale and sweet potatoes are awesome together. 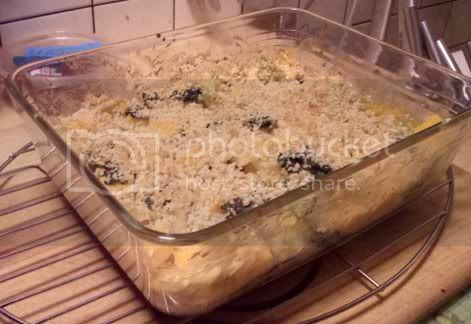 And Vegan Yum Yum proves this with the Creamy Sweet Potato Bake recipe. 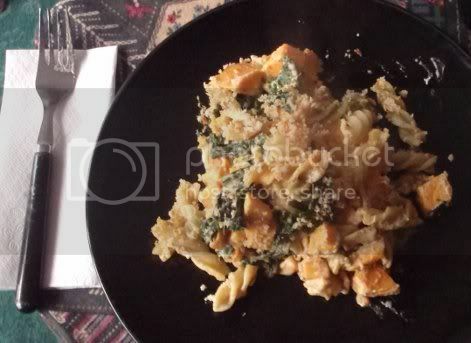 Spiral pasta plus sweet potatoes plus kale, coated in vegan Alfredo sauce and baked. That’s four of my favorite foods prepared together in one of my favorite ways! It couldn’t be more perfect. Plus, I got to play with the Kitchenaid. Anyone who’s spent any length of time in my kitchen knows that I love an excuse to watch this blender do its thing. It made the alfredo sauce deliciously creamy without any effort at all. Another thing I loved about this recipe is that it only takes 20 minutes to bake. The pasta and sweet potatoes both need to be cooked beforehand, but then it all comes together pretty quickly. 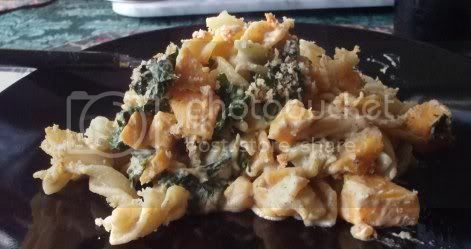 Much as I love baked pasta, I sometimes get impatient waiting 30-40 minutes for some other recipes to cook! I don’t think there’s anything to dislike about this recipe. 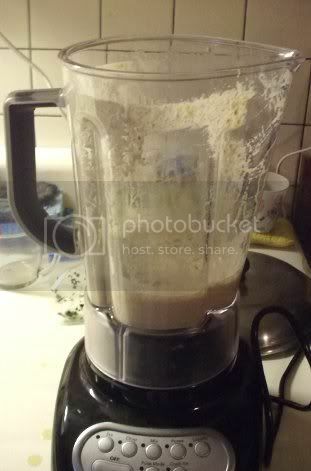 The Alfredo sauce is flavorful and pretty close to “real” Alfredo, and the mixture of tastes and textures is wonderful. And I think it’s hard to get sick of sweet potatoes and kale, whether together or on their own. Question for the comments: What’s your favorite way to use kale?